Canola Oil « Global Market Insights, Inc.
A paradigm shift from conventional PU products to eco-friendly products will stimulate Natural Oil Polyols Market size over the coming years. Regulatory bodies across the globe have enforced norms pertaining to the rising GHG and carbon emissions, owing to which biotechnology companies have shifted to manufacturing bio-based PU, which in turn will spur natural oil polyols industry. These products are obtained from vegetable oils and are used to produce polyurethane used across the automotive and transportations sectors. Ford Motor Company, the renowned American automaker, had recently used soy oil based PU foam for its seating in the popular Ford Mustang. Soy oil based foams are heavily utilized for plastic & metal coatings, door foamers, footwear cushioning, wood & concrete coatings, and headliners, which will subsequently propel NOP market trends. Global market Insights, Inc., affirms natural oil polyols (NOP) industry to surpass a valuation of USD 10.3 billion by 2023, growing at a CAGR of 7% over 2016-2023. Bio-based PU possess the properties of high performance, durability, and sustainability. In fact, the demand for bio-based polyurethane was more than 1600 tons in the year 2015 and is estimated to surpass 2600 tons by 2023, with a CAGR projection of 6.5% over 2016-2023. 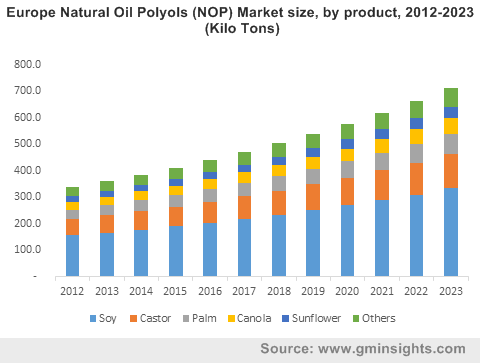 The rising usage of bio-based PU in numerous end-use sectors will consequently lead to the growth of natural oil polyols market. Natural oil polyols industry from palm oil products is expected to record a CAGR of 7% over 2016-2023, subject to the vast farmlands of castor and palm oil tress across South East Asia and the technical advancements in extraction techniques. It has been predicted that palm oil market will witness the maximum growth across the Asia Pacific belt. The surging automotive and construction sectors across the emerging economies of India and China will fuel the regional natural oil polyols industry. With China and India being the main contributors, Asia Pacific NOP market will register the highest gains of 7.5% over 2016-2023, and will cross USD 2.75 billion by 2023. This growth can be attributed to the increasing demand for the product in lubricants, solvents, and additives and the rising awareness regarding bio-based products. Soy oil dominated the product landscape of natural oil polyols industry in 2015, with a valuation of USD 1.7 billion. This product is heavily utilized across the automotive and transportation sectors. In addition, the rising number of soy acreages across Brazil and the United States will push natural oil polyols market growth from soy oil. Renowned firms such as the Dow Chemical Company and Cargill have already begun to commercialize soy based natural oil polymers to produce PU spray insulations and foams. This product is quite prominent across the United States and will contribute toward the growth of the regional natural oil polyols industry. In 2015, with a valuation of more than USD 2.1 billion, North America dominated the worldwide natural oil polyols market. The regional business volume was 800 kilo tons in the year 2015 and is expected to significantly grow over the years ahead, subject to the favorable government rules and increasing consumer awareness. It has been predicted that castor oil products will observe the maximum gains of 7.5% over 2016-2023, pertaining to the product purity and hydrolysis resistance. This product also requires the least modification as opposed to palm oil and soy oil, which will spur the overall natural oil polyols industry. Sunflower oil products, on the other hand, will witness a growth rate of 6.5% in Europe and are expected to exceed a volume of 42 kilo tons by 2023, thereby stimulating natural oil polyols market. NOP products will find ample utilization across the LATAM belt, subject to the growing construction sector and rapid industrialization in the region. With Brazil at the helm, LATAM natural oil polyols industry will observe a CAGR of 9.5% over 2016-2023 and will exceed a revenue of USD 400 million by 2023. Renowned organizations such as EPA and REACH have formulated norms to reduce the carbon emissions in the atmosphere, which will fuel natural oil polyol market. It has been observed that the manufacturing process of NOPs reduces nearly 25% of the energy demand and generates almost 30% less carbon emissions. In addition, the EES (European Emission Standards) has also been striving to reduce emissions from the automobile tail pipe, for which it has standardized certain regulations. Since these emissions are specifically caused by the vehicle weight, it becomes imperative for manufacturers to use bio-based counterparts, which will impel natural oil polyols industry. Natural oil polyols market is quite consolidated and is shared between selected participants. Major players operating in this market include Dow Chemical, Urethane Soy Systems, Elevance Renewable Sciences, Hunstman, Cargill, BioBased Technologies LLC, Emery Oleochemicals, BASF, Bio Amber, Vertellus Specialties, Stepan Company, Lubrizol, Covestro, Jayant Agro Organics, Mitsui Chemicals, and IFS Chemicals Group. This technology-driven market is expected to chart out a profitable roadmap for itself over the years ahead. This entry was posted in BIOMASS, BIOENERGY AND RENEWABLE CHEMISTRY and tagged Canola Oil, Castor Oil, Global Natural Oil Polyols Market, Natural Oil Polyols Market, Natural Oil Polyols Market Analysis, Natural Oil Polyols Market Size, Palm Oil, Soy Oil, Sunflower Oil.